As the old adage goes, history is written by the winners. That is why the Union side of the American Civil War is almost unanimously remembered as the “good guys” who risked their lives to abolish slavery. One of the most revered Union leaders was Ulysses S. Grant, a legendary general and eventual 18th President of the United States. 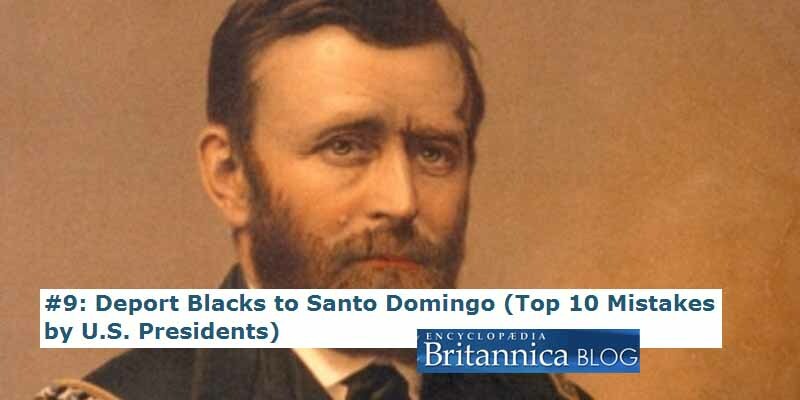 One embarrassing thing that’s easily forgotten is that as President, Grant did not see freed slaves living peacefully with their former masters, so he came up with a ridiculous plan to buy the Caribbean island of Santo Domingo and deport all 4 million freed slaves there. Grant’s proposal made it to the Senate, where it was absolutely buried by the opposition led by Senator Charles Summer. Summer’s arguments were the constant political upheavals on the island and its president Buenaventura Baez being a “political jackal” among other things. In the end, the proposal was deadlocked at 28-28, short of the two thirds of votes required to put it into action and that was that. Obviously, President Grant meant well, but how could you hear a proposal like that today without cringing?